Our Oklahoma electrician continuing education courses are approved by the Construction Industries Board to satisfy your continuing education requirements. Take the continuing education to renew your OK electricians license today. All of our courses can be completed At Your Pace Online to help you meet the state's requirements to maintain your license. Once you finish your class you will have an official certificate of completion to save for your records, and we will report your course completion to the state for you. In the state of Oklahoma, electrical technicians are required to obtain 6 hours of continuing education every Code cycle (once every 3 years). Your request for six (6) hours of continuing education credit covering Oklahoma 6 Hour 2017 NEC Correspondance CE based on the 2017 National Electrical Code has been reviewed and approved. 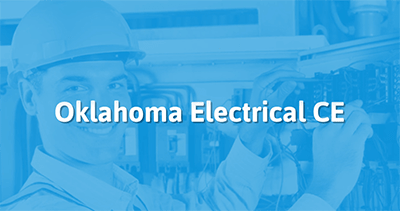 This course will meet the OKlahoma requirements of continuing education over the 2017 code National Electrical code for each Electrical contractor or Electrical journeyman attending this seminar.